A few years ago I went to my friend Amanda’s house for dinner. Amanda is known for being good at just about everything, cooking is no exception, however, when she informed me she had just made Moussaka, the only visual my mind could come up with was poor little Toula Portokalos and her lunch that the bratty blonde girl made fun of in My Big Fat Greek Wedding. The blonde girl behind her “What’s that?”. Toula: “It’s Mousska.” Blonde girl: “Moose kaka? 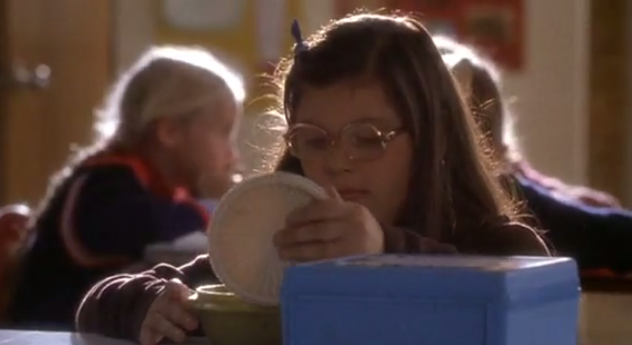 !” I felt so bad for sweet Toula. What was in that green tuperware container anyway, my mind was fearful yet curious . . .
I’d like to report that Toula and Amanda had it right all along, I would trade all the wonder bread sandwiches in the world for one serving of Moussaka! 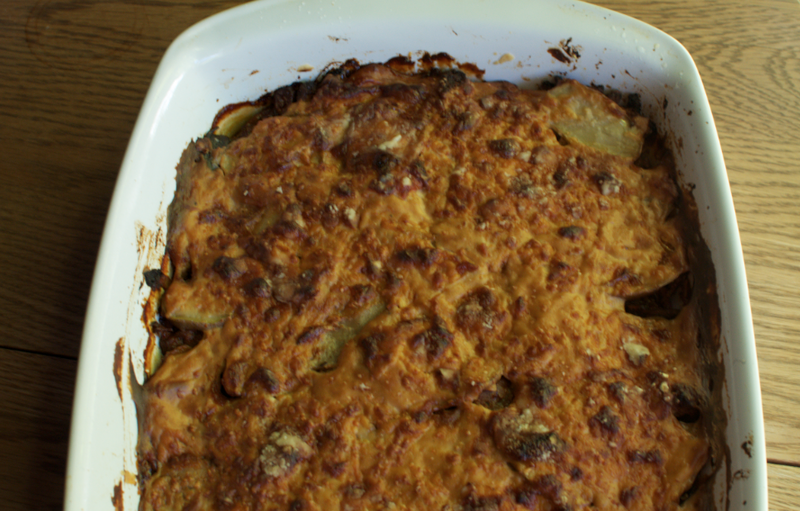 Amanda’s made my mouth water and I wanted more, but it seemed quite the feat for a casserole. Despite many a internet search every recipe I found had about 15 steps and three different sauces and an ingredient list that was over my tolerable limit. Yet, in these times of seemingly unlimited time (I’m still unemployed . . . cue the sad face) I figured I could conquer this incredible casserole. 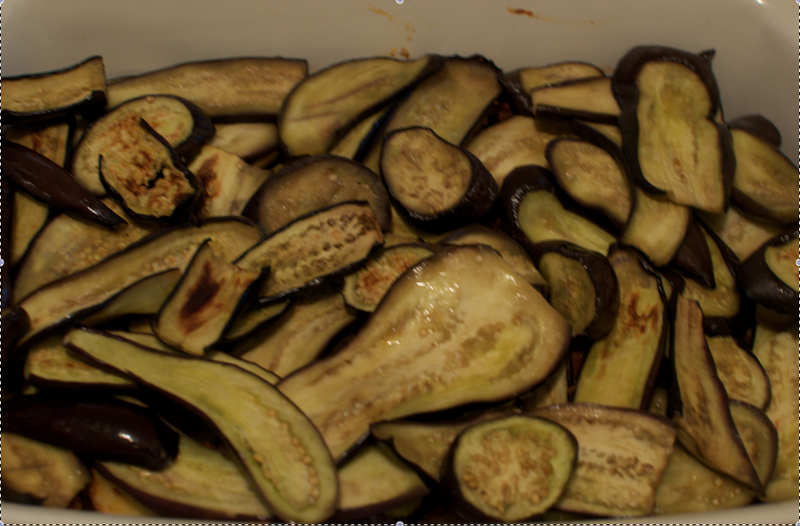 So, what is moussaka, you might ask? 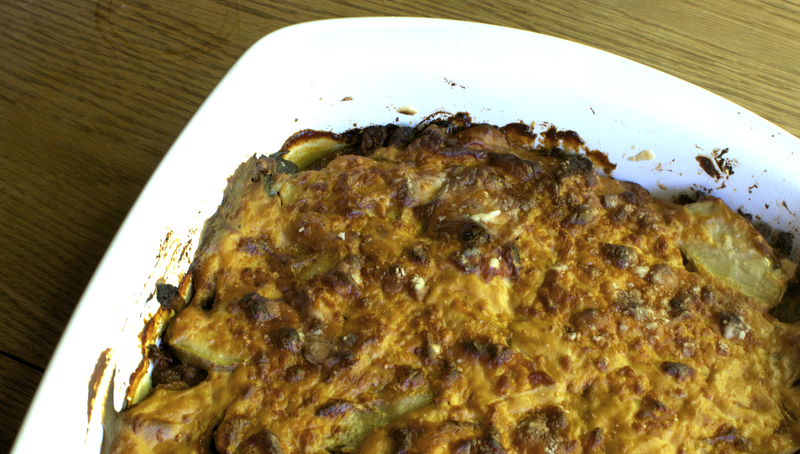 Well, although there are MANY variations GREEK moussaka is a layered casserole made with eggplant, ground meat (traditionally lamb), potatoes topped with Béchamel sauce and parmesan. The meat sauce is tomato based, but instead of Italian seasoning (Parsley, basil, oregano) it has cinnamon and nutmeg in it. 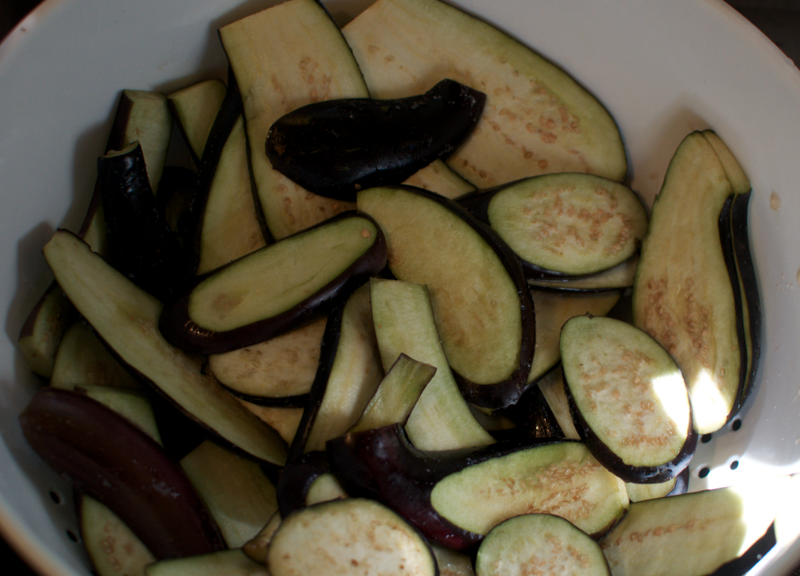 Layers of potato, meat sauce and eggplant are common along with other vegetables. If this sounds very odd, stay with me, it did to me too, I couldn’t really fathom enjoying meat with cinnamon in it, but somehow the cinnamon and the tomato sauce melds together in the most delicious way. It can easily be made GLUTEN FREE, however I did not prepare my Béchamel sauce without flour. 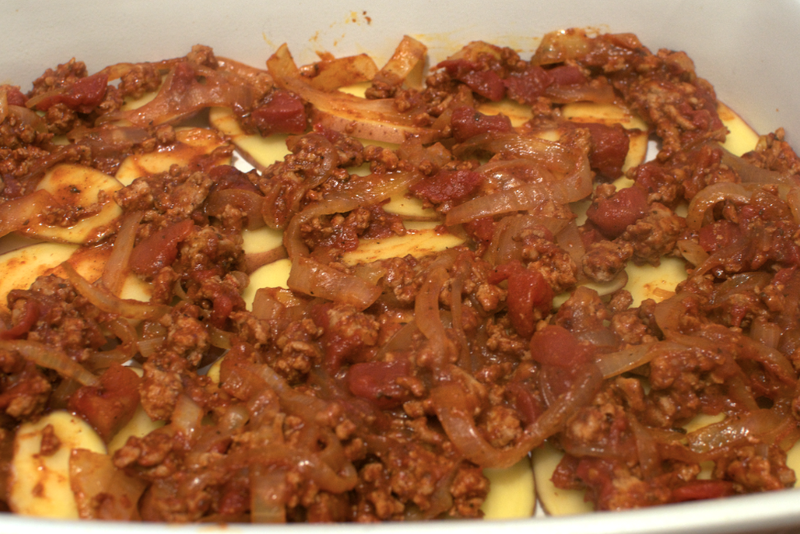 I like the fact that moussaka is a “one pot meal”, complete with veggies, potatoes and meat. It is packed full of flavor, so much so that I actually didn’t add any hot sauce to the recipe (can you believe it?). And it is better the next day! I read that Greek moussaka is traditionally served luke warm, and although this sets off my highly sensative former-dietary-manager-food-safety-alarm, I think they are right. It’s even good cold! Why on earth did I think this was hard? This was just as easy as lasagna (if not more so), and the Bechamel sauce took 10 minutes flat. Next time I make this and I know exactly what I’m doing, it shouldn’t take more than an hour. I made this in the afternoon and refrigerated it before cooking, it took about 90 minutes to cook in an 350degree oven! And it freezes very well, so I’m using some leftovers as happy hubby meals! 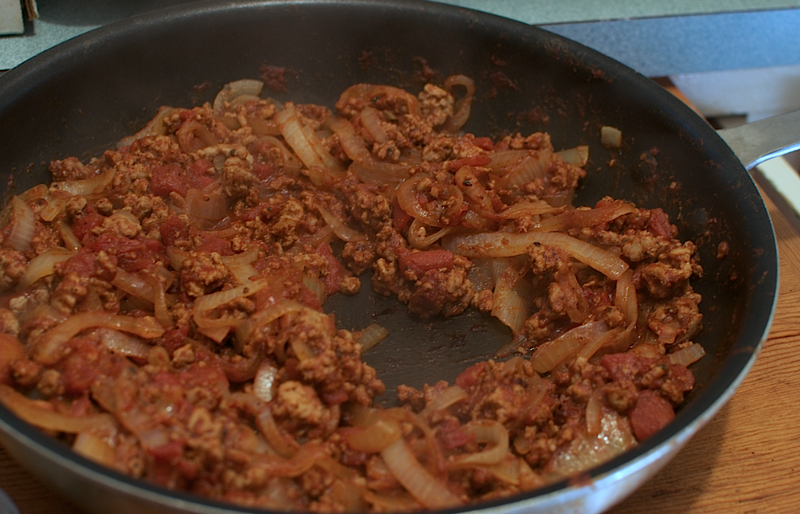 In a large skillet cook ground turkey on medium high heat until no longer pink (4-6 minutes), drain excess oil, add cinnamon, nutmeg, pepper, salt, tomato paste, diced tomatoes and onion to skillet, turn to medium heat, stir and cover, allowing onions to soften and flavors to meld. 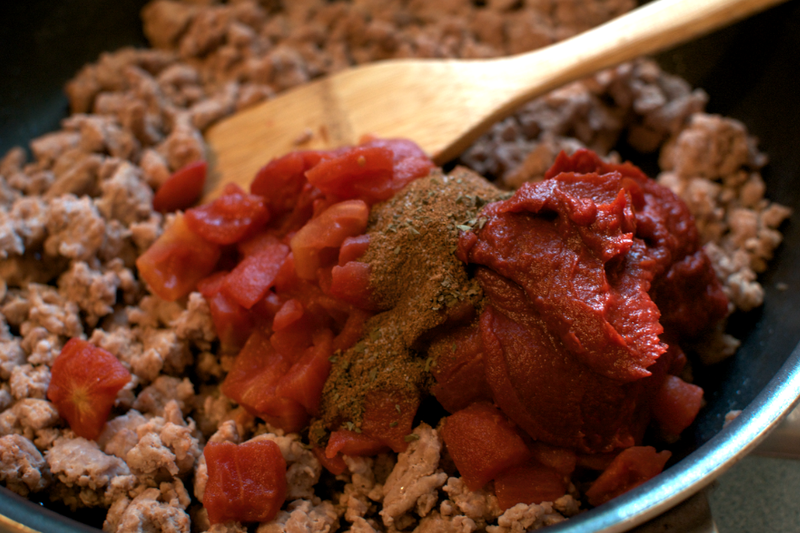 Cook for 10 minutes stiring frequently, so meat sauce doesn’t burn, it will be thick and mostly turkey. Preheat broiler to high. 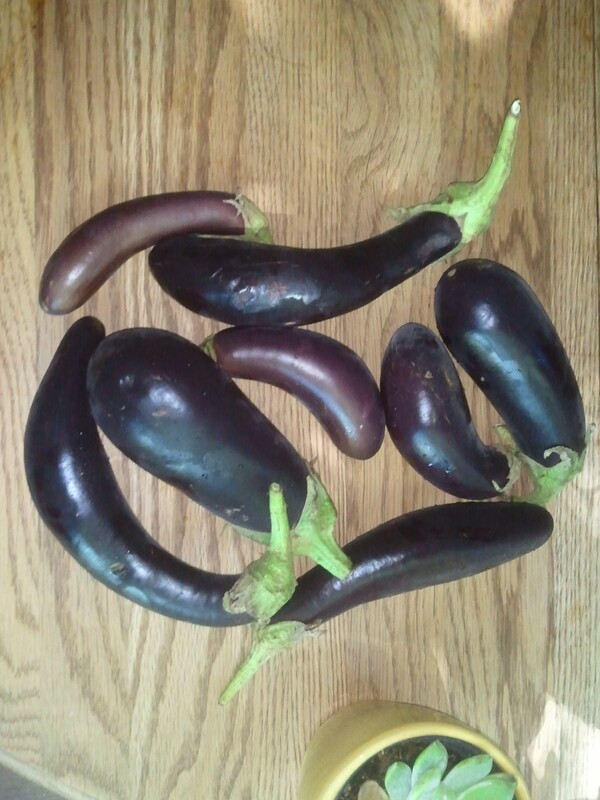 Thinly slice eggplant, toss with salt in a colander over sink, allow for salt to pull the excess liquid out of the eggplant, let sit for 20 minutes. Once done, rinse the eggplant (yes this seems counter-productive, but this technique really takes the bitter edge off and brings out the natural flavor of the eggplant). 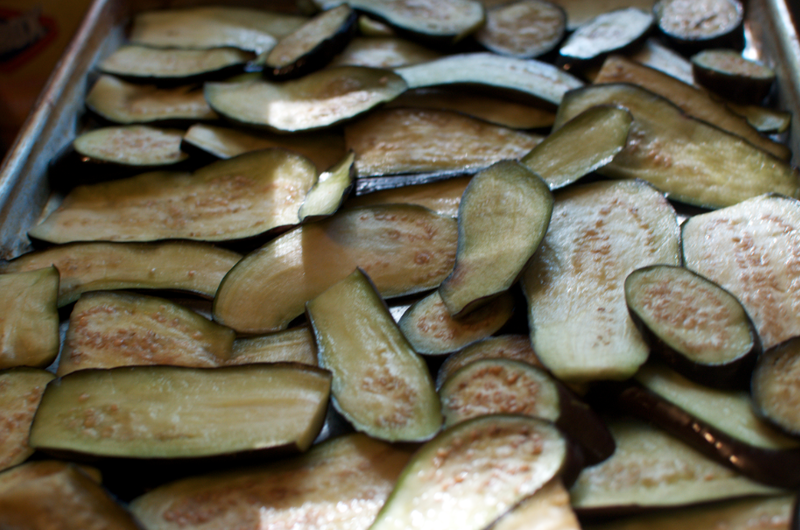 Place eggplant on a sprayed, non-stick pan, drizzle with olive oil and broil until edges brown, 5-6 minutes. Remove from oven and allow to cool. 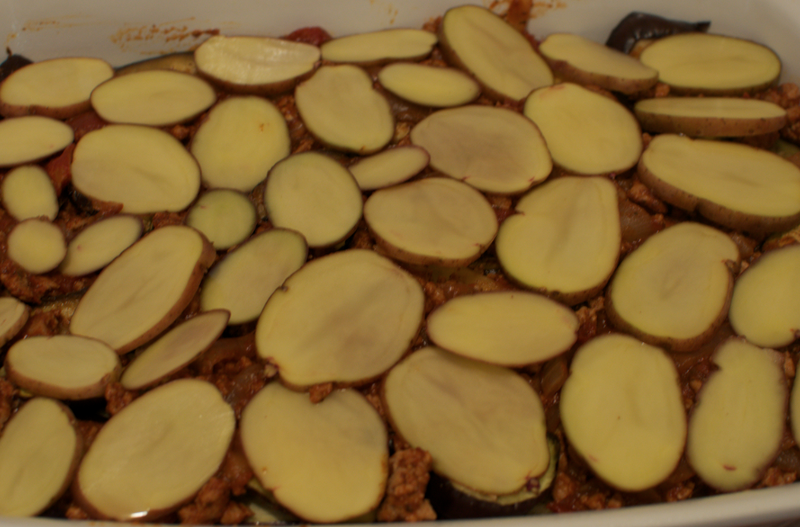 In a large casserole dish (sprayed with non-stick coating) place one layer of sliced potatoes in bottom, top potatoes with HALF of the turkey sauce, follow with a layer of eggplant (I used ALL the eggplant in one layer) follow with the other half of the turkey sauce. 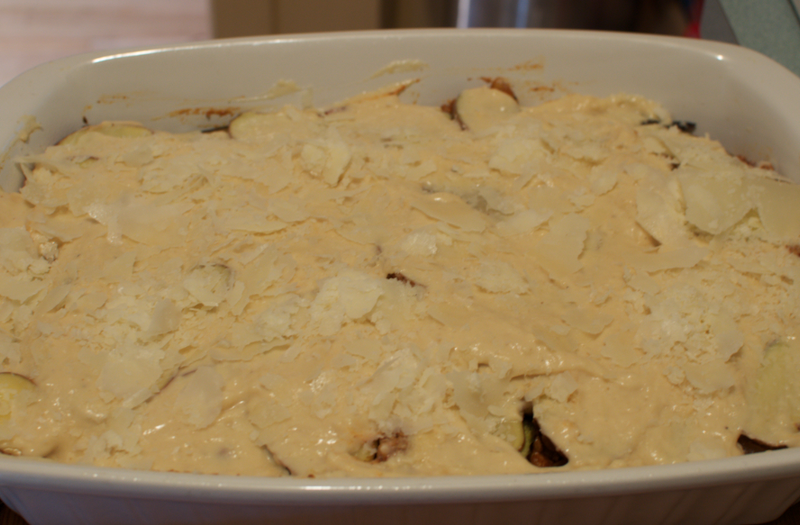 Top this with another layer of potatoes, let sit while making the béchamel sauce. Heat milk in small sauce pan just until boiling, take off heat immediately allow to cool slightly. In small pan mix butter and flour together on medium heat to form a roux, once butter and flour are incorporated add milk slowly while whisking quickly to ensure the sauce does not become lumpy. 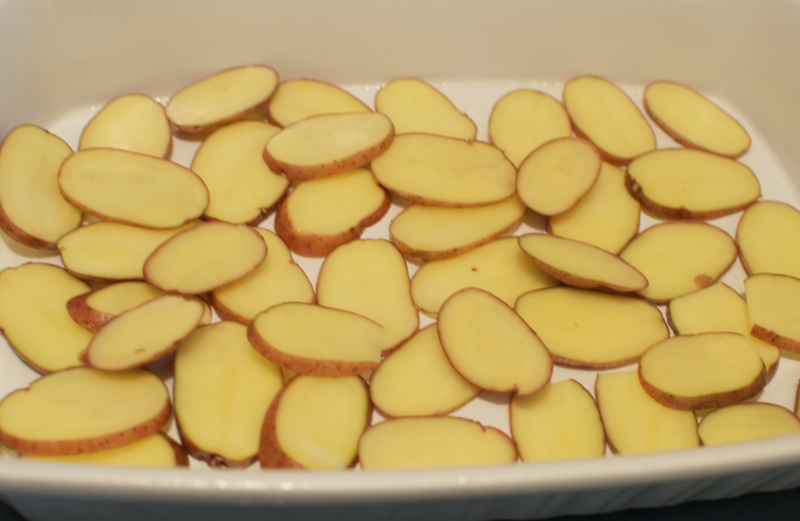 Add 1/2 tsp nutmeg and 1 tsp salt, allow sauce to cool slightly and pour evenly on top of final potato layer. Bake in a 350degree oven for about 90 minutes, béchamel sauce should have a nice brown color to it. Your kitchen should smell so awesome your mouth is watering. 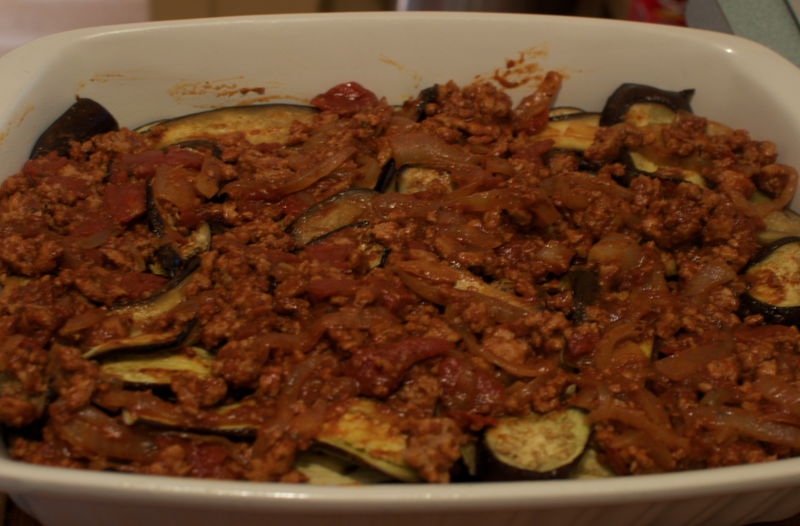 Next time I’ll incorporate green peppers, mushrooms and zucchini into the layers. This was truly incredible. And although the béchamel sauce is far from healthy it is actually lower in calories than cheese, next time I’ll try one of the yogurt based béchamel sauces that are so popular on pinterest, I’m sure it’ll be AMAZING!